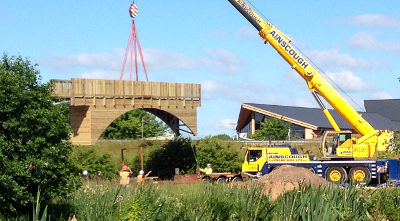 A distinctive £85,000 footbridge has been craned into place at Mercia Marina ahead of the opening of a new 200 spaces overflow car park later this year. The new car park is on the opposite side of Findern Lane in Willington on the site of two fields already owned by the marina and is set to open in August 2018. Staff who work at the marina and businesses based there will be able to use the overflow car park, which will be barrier controlled, during the week freeing up space for visitors in the main car park. Visitors will be able to use the overflow car park at weekends. 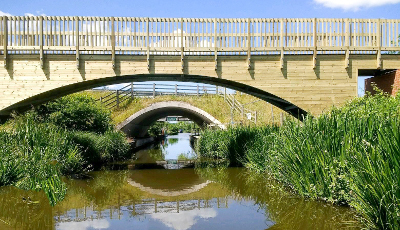 The new footbridge connects the overflow car park with a wildlife pond area on the same side of Findern Lane. Staff and visitors who use the overflow car park will go under Findern Lane by using the new footbridge to go over the water entrance to the marina and then go under Findern Lane. “We are delighted with the new bridge which is a beautiful structure and another fantastic addition to Mercia Marina ahead of the new 200 spaces overflow car park set to open later this year. “The planners wanted a ‘canal’ bridge so the designers sketched an asymmetrical humpback bridge with a towpath. It was intended to be made from wood but a lasting humpback bridge cannot be built from wood so the innovative bridge builders, CTS, came up with the idea of cladding the steel lattice work below the walkway in timber to produce the humpback bridge effect. The bridge and the new car park are the latest developments at the marina, which attracts we are told 800,000 visitors a year. The new £3m Piazza landmark building opened earlier this year and is the global HQ of Bionical, as well as offering a tapas-style Indian restaurant, which is set to open soon, Bluebird Gallery, Twigg Home, William Wheelwright Hair Salon and Black By Design’s showroom and shop.